Shrink Sealing Systems apply tamper-evident banding. Featuring stainless steel frame, upstream photo-eyes, and Allen Bradley touchscreen interface, 50 Series ShrinkSealers apply tamper-evident banding and shrink sleeve labeling at up to 130 cpm, continuously. Systems run 40-50 micron banding materials and are compatible with all petroleum-based and sustainable films, including PVC, PET, PETG, OPS, and PLA films. Material can range from .375-3 in. D and .625-7 in. H. Modules for both vertical and horizontal perforations are available. Norwalk, CT. PDC International Corporation, a world leader in the development and manufacturing of tamper evident labeling systems, has introduced the 50 Series ShrinkSealers. PDC "50" Series ShrinkSealers fill a need that is common today: the need for a highly reliable, multi-use shrink sealing system that offers moderate speed performance - and a moderate price. 50 Series ShrinkSealers apply tamper evident banding and shrink sleeve labeling at up to 130 cpm, continuously. These PDC ShrinkSealers are engineered to run thin film (1.5 to 2 mils, 40 to 50 micron) banding materials, and are compatible with all petroleum-based and sustainable films, including PVC, PET, PETG, OPS and PLA films. Modules for both vertical and horizontal perforations are available. 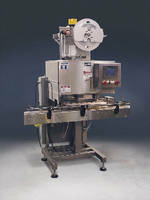 50 Series ShrinkSealers can apply tamper evident banding or shrink sleeves, including full-height body sleeves. Material diameters can range from .375 to 3" (10-75 mm) and heights from .625 to 7" (15 to 180 mm). Like all PDC machinery, these robust labeling systems are engineered for 24/7 operation. Despite their moderate price point, 50 Series ShrinkSealers have many important features as standard. Included is a stainless steel frame, upstream photo-eyes, a "material-out" sensor, and an Allen Bradley touch screen interface. Changing from one product to the next is fast and ergonomic, thanks to PDC's exclusive "tool-less" changeover feature. Companies who want to customize their system can specify a broad range of secondary sensors and package enhancements. Sensors include fallen bottle, splice detection, film feed jam, ejection verification, and others. Package enhancers include tear tab blades, and slit tab blades. Downstream photo eyes, and bar code verification can also be part of the system's capabilities. Like all PDC packaging systems, the 50 Series was made in the USA, and uses standard, widely available components. It is ideally suited for manufacturers and job shop packers who want cost-effective equipment for applying plain or promotional seals with high reliability and consistency.